Part of this year in Spain is, for Andrew and I, intended to be an opportunity to explore parts of the country we don’t yet know, and dig around to see if there are places we love more than our home in the Lecrin Valley. Having read Gerald Brenan’s account of his 7 years living in the Alpujarras South from Granada, one of the first trips we had in mind was across to the village of Yegen to see the house in which he lived. You may have noticed that the name of our blog is not dissimilar to the title of Brenan’s book, and this is no accident, as his writing did inspire us! Yegen is in the eastern Alpujarras and is, as we discovered, quite removed from the more touristy western reaches, around and above Órgiva. On previous excursions, we have explored the delightful villages of Pampaneira, Bubión and Capileira, and we have bought jamón from Trevélez. These western pockets have been made famous through the writing of another British author, Chris Stewart, former drummer for the rock band, Genesis before they really hit the big time! There is no doubting that the ‘Chris Stewart’ effect, through his books ‘Driving over Lemons’, ‘Parrot in the Pepper Tree’ and ‘The Almond Blossom Appreciation Society’, has had an effect on this part of Spain, and the dream of living a similar rural life has, I am sure, influenced many a property hunter. The eastern range of Las Alpujarras is noticeably more rural, peaceful and remote, for want of a better word, but it is no less beautiful. The start to our road trip was marred slightly by domestic trauma. Our water was cut off just before I was due to shower prior to our departure. Now, those people who know me very well will know that this did not go down too splendidly. Standing in the shower looking at a sad dribble of liquid sputter from the shower head did little to brighten my mood. As it drained to nothing, my mood deteriorated. I ended up trying to squeeze various parts of my body sequentially into a basin filled with what water was left in the kettle, and had to make do. Neither of us likes a mystery of this nature, so we sent SOS messages to the couple who take care of the pool, and they replied that the supply to the whole village had been cut off; it was not due to any non-payment of bills! That slightly dispersed the black cloud in the car as we set off, and we could start to concentrate on the adventure ahead, instead of the vagaries of the Ayuntamiento and their decision to plunge the house into an unwanted drought. We drove south; our preferred route into Las Alpujarras is on the south side of the hills, taking us away from Órgiva, a town about which we still have reservations. As soon as you leave and cross beneath the motorway, you find yourself in the most glorious scenery: to the left, Las Alpujarras and the Sierra Nevada, and to the right, the Sierra de la Contraviesa. The A-346 runs alongside the eastern expanse of the Embalse de Rules - a wild reservoir where the rugged surrounds simply plunge down into the turquoise waters with no gentle shoreline. Reddish cliff faces are punctuated by the delicious green of pine trees - a landscape that, to us, is so redolent of the Tramuntana Mountains along the west coast of Mallorca. As we drove deeper into the Alpujarras, we could see the Sierra Nevada range opening up on our left hand side, and along this route you realise just how long the range actually is. As we drive to and from Granada going about our daily activities, it is easy forget that we only see the western end of this range. On our previous trip to Trevelez, we had driven past the village of Torvizcon, and decided that it needed closer inspection, and so we duly stopped here for media mañana and at a cafe near the village entrance we had what was possibly the best tostada con tomato we have had since arriving in Spain. To the uninitiated, this might not set the world alight, but when you are served lightly toasted fresh bread, with a separate little bowl of freshly pulped tomato, a little tub of local olive oil that glowed in the sunlight, to spread on the toast, there are very few things that taste so delicious as a mid morning snack. 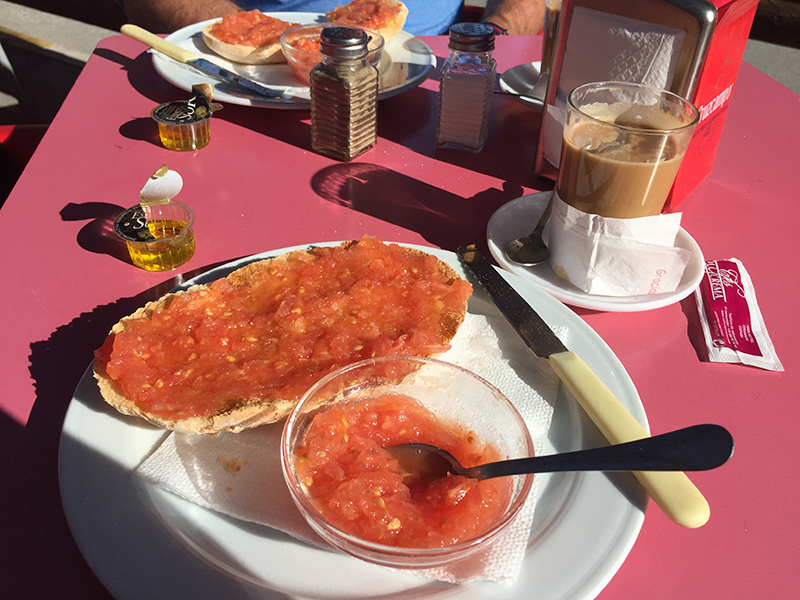 The best (2nd) breakfast in Spain. As we drove on, we did consider a quick detour to one of the bodegas (vineyards) that litter this route, but decided we would save that for another trip! See, we do show a degree of self-restraint. Every corner of this drive reveals more beautiful scenery, and it is easy to run out of superlatives, so I won’t even try to find words that describe how gorgeous this part of Spain is. 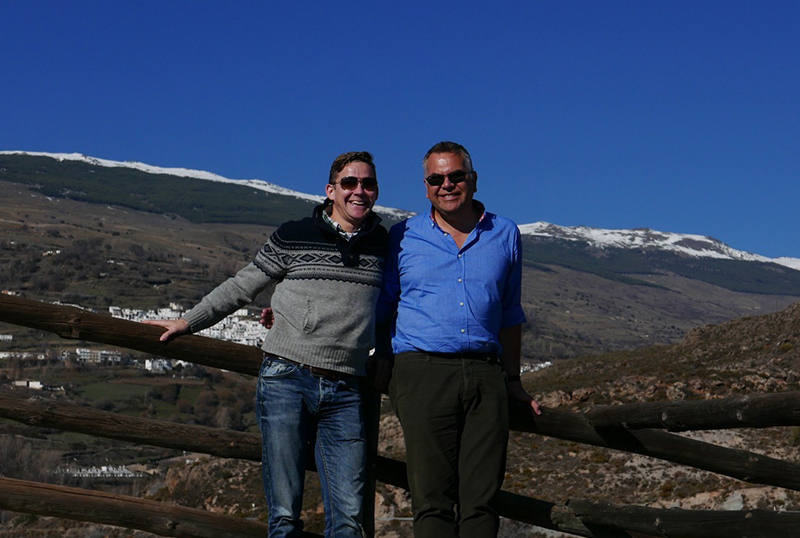 The more I visit the Alpujarras, the more I love it, and I think that Andrew feels the same. There are lots of ‘oohs’ and ‘aahs’ emitted as we potter along the roads in our under-powered Toyota. Eventually, we started to see signs for Cádiar, a name that we remembered from Gerald Brenan’s book of his time here in the foothills of the Sierra Nevada. “ When one looks south from Granada, across the red towers of the Alhambra one sees a range of mountains known as the Sierra Nevada which have snow on them all the year round. This is the famous view, so endlessly reproduced on picture postcards, which brings the tourist to Andalusia in the Spring. But forget the Alhambra, forget the nightingales, and consider only the mountains. They are high enough to boast of having small glaciers, and if you cross them you will come to a broad, hollow country, very broken and separated from the sea by a coastal range. It is this country, which till quite recently could only be explored on foot or mule-back, that is the subject of this book.” Gerald Brenan, South from Granada.